Godspeed to Marestella Torres and Rene Herrera! 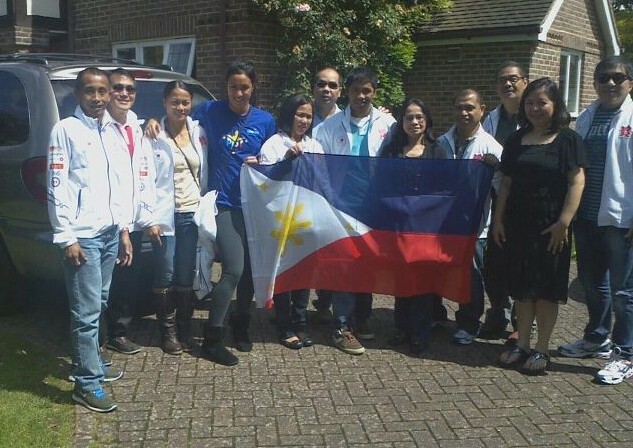 The Philippines will be sending two representatives to the Athletics competition in the London Olympics – long jumper Marestella Torres and steeplechaser Rene Herrera. 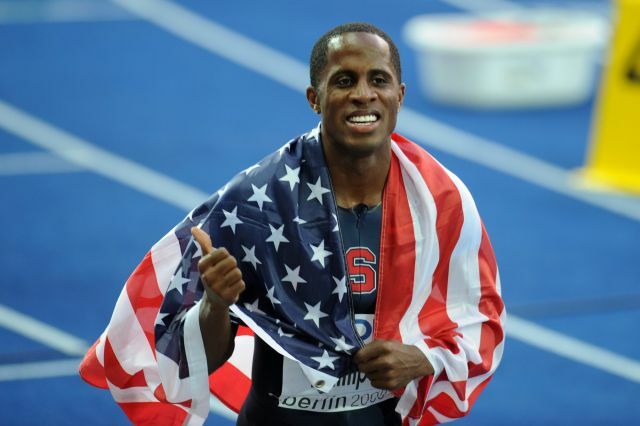 The 32-year old Torres is the national record holder for both the long jump (6.71m) and the triple jump (12.67m). She is a multiple Southeast Asian Games long jump gold medalist. 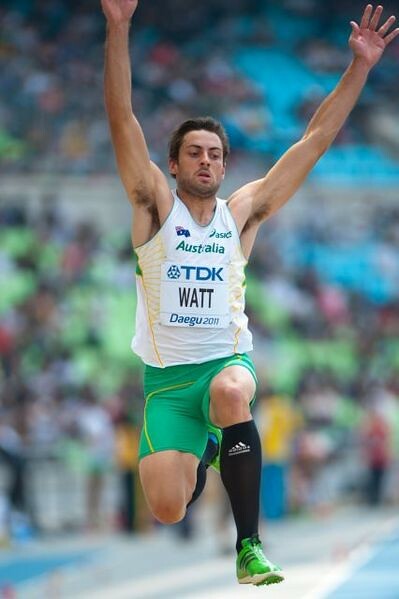 Upsetting the biggest names in regional long jumping, Marestella won the 2009 Asian Championships title in Guangzhou. The powerfully compact Torres is a veteran of numerous major international events, having competed in three editions of the World Championships and three in the World Indoors. Her season’s best stands at 6.62m. Marestella is on her second Olympic team. Like Torres, Herrera is a multi-titled national athlete. 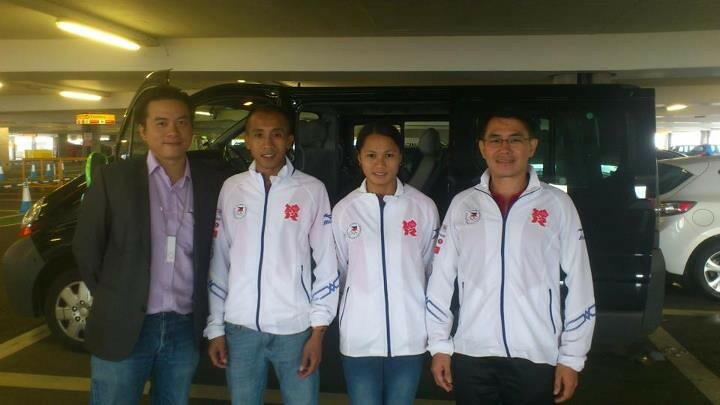 He has won five Southeast Asian Games gold medals in the 3000m steeplechase, from 2003 to 2011. The 33-year old has made the final in two editions of the Asian Games, an event spiced with a multitude of African-born athletes. He has a personal best of 8:49.39. 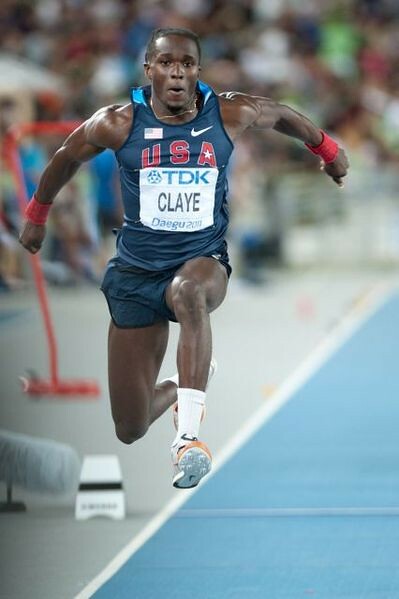 His best time in 2012 is 9:05.84, set while winning the National Championships in Dumaguete. Rene will make his Olympic debut in London. Torres has what it takes to barge into the long jump final, but it’s going to be an uphill climb as she goes head-to-head against a multitude of 7-meter and near-7 meter jumpers. 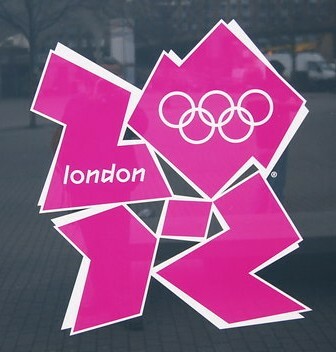 The rainy and soggy London weather might just level the playing field a bit. The Philippines’ hopes in Olympic Athletics might not be at par with the world’s best, but this won’t keep me from cheering my compatriots. Godspeed to Marestella Torres and Rene Herrera! 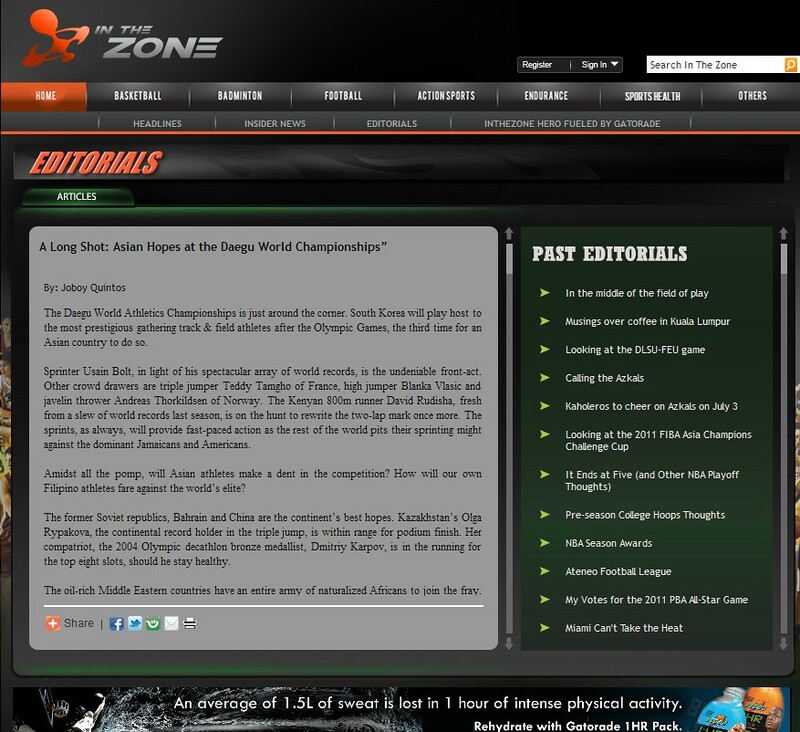 The Asian championships were held in the Japanese city of Kobe from 8-11 July 2011. This is the region’s most prestigious competition, a good warm-up for the Daegu World Championships in August. The big guns of Asian athletics took center stage, despite the absence of a few. Japan (11-10-11), according to an IAAF report, topped the medal standings for the first time since 1981, edging out powerhouse China (10-12-5). Liu Xiang 刘翔, as expected, lorded it over the sprint hurdles field, setting a new championship record of 13.22s. Shi Dong Peng 史冬鹏 (13.56s) was a far second as he overtook South Korean veteran Park Tae-Kyong 박태경 (13.66s). Thailand’s Chamras Rittedet was the fastest Southeast Asian as he went under the thirteen second barrier (13.96s). 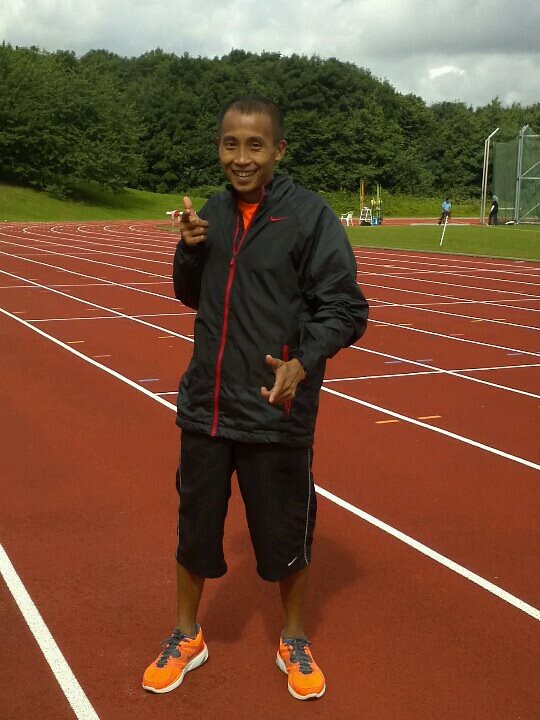 Malaysia’s Rayzam Shah Wan Sofian ran 14.03s. Mutaz Essa Barshim‘s 2.35m winning mark in the high jump was, without a doubt, the highlight of the meet. 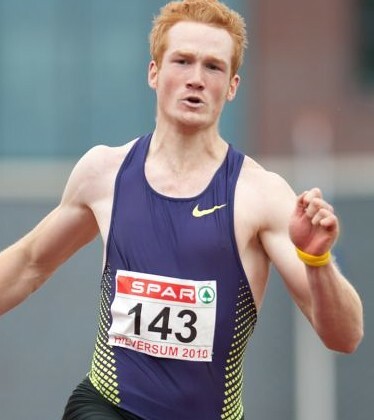 The reigning World Junior Champion tied the second best mark in 2011, en route to setting his nth Qatari record. Barshim, at merely 20 years of age, is a potential medalist in Daegu – should he overcome the nerves of high-level senior competition. 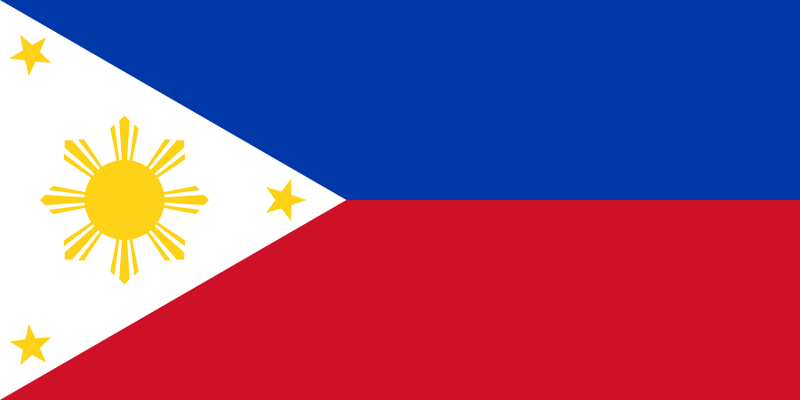 The Philippine delegation came home empty-handed, as defending long jump champion Marestella Torres missed out on a podium finish. The Filipino record holder could only managed a best leap of 6.34m in the fourth round, way off her 6.51m winning jump in Guangzhou two years ago. Torres has a season’s best of 6.38m, set in Bacolod during the PNG. Rene Herrera clocked 9:12.34 in the 3,000m steeplechase, good enough for eighth place in a race dominated by naturalized Africans. Arniel Ferrera, meanwhile, narrowly missed the sixty-meter mark in the hammer throw (59.25m), placing ninth in a field of eleven. Ferrera set a season’s best in Kobe. 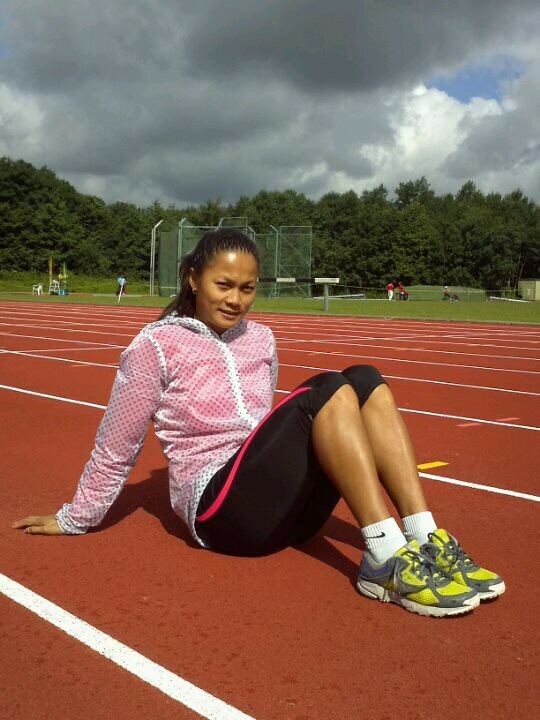 Heptathlete Narcisa Atienza scored 5,041 points and ranked seventh. As expected, Japan’s 2009 World Championship bronze medalist Yukifumi Murakami 村上 幸史 dominated the javelin throw his 83.27m fourth round flick. Murakami’s third round throw of 80.93m was also better than Jae-Myoung Park’s 80.19m. Host country Japan stamped its class on every single relay event. The winning margins were quite massive. The Japanese men won by a straightforward eight-hundredths of second in the 4x100m relay over the Hong Kong squad, which surprisingly beat regional powers China and the slick-passing Thais. On the distaff side, Japan was even more dominant. Anchored by 200m gold medalist Chisato Fukushima 福島 千里, the Japanese women led by a comfortable 0.18s over the Chinese. 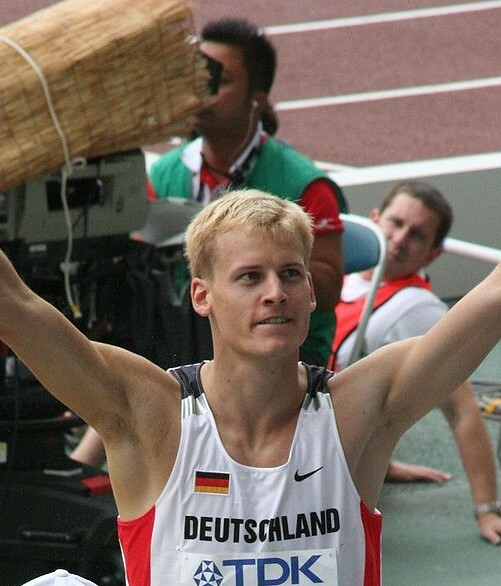 In a high quality men’s long jump competition, four men went beyond eight meters. Su Xiongfeng won gold with his 8.19m leap second round leap. 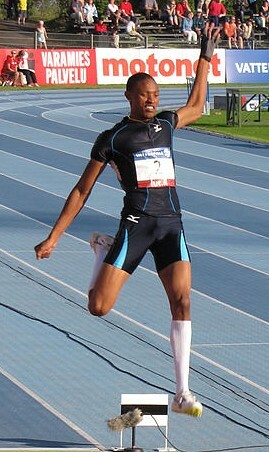 The 2009 World Youth Champion, Suphanara Sukhasvasti, clinched second with 8.05m. According to Jad Adrian, this is the best ever jump by a Southeast Asian. 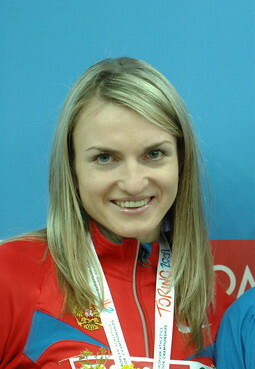 Despite the absence of 2010 World Indoor Champion Olga Rypakova, Xie Limei 谢荔梅 entertained the Japanese crowd with her world-class 14.54m mark in the women’s triple jump. Uzbekistan’s Valeriya Kanatova (14.14m) placed second as India’s Mayookha Johny മയൂഖ ജോണി won bronze en route to setting a 14.11m Indian record. Mika Santos answers the 10-for-10 quiz! Santos started as volleyball player back in high school. 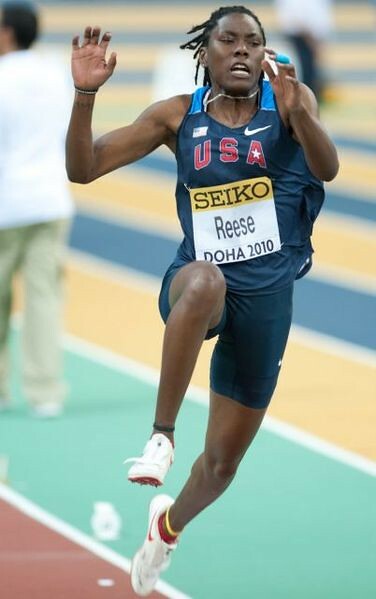 In college, she gave track & field a shot. Although she had decent sprinting ability, her best event was definitely the pole vault. With her gymnastics background, Santos was tailor-made for athletics’ most technical discipline. About a year after she started training for pole, Santos broke Marestella Torres‘ Philippine record with her 3.20m* leap in the Hong Kong Intercity Athletics Challenge. 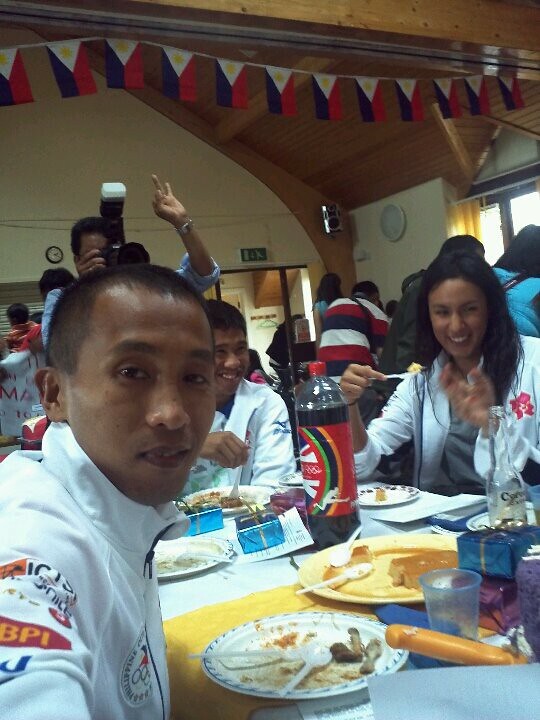 The comely Ateneo graduate competed in the 2005 Manila SEA Games. The multi-talented Santos currently works as a travel writer, dabbles in the occasional print or TV ad and hosts her own travel-oriented show. 1.) How did you get started with track? 2.) What’s the most memorable moment of your track career? 3.) What’s your life-long dream? Depends what event.. for long jump tights of course. For everything else, short shorts. Too hot in the Philippines! 5.) If you could be a Glee cast member, who will you be? And what song will you sing? … I don’t know but I’d definitely date Puck. 6.) How I Met Your Mother or F.R.I.E.N.D.S.? Both.. but FRIENDS is the classic I grew up with. 8.) Star Trek or Star Wars? 9.) If you could spend the rest of your days at any place in the world, which would you choose? 10.) Name three things you just can’t live without. 11.) Fill in the blanks: I’ll run an ultra marathon just to go out with _________. Thank you for answering, Mika! * – Deborah Samson owns the current Philippine record of 4.11m.